Pregnantly Plump: Like Mommy, like boys? My mom saved just about every one of my dolls and stuffed animals from my childhood, as well as most of my baby clothes. Obviously, it was for naught. But she sometimes tries to get the boys interested in my old toys. She brought out my Kid Sister (Cindy) and my My Buddy (Mikey, I believe) this past weekend. I loved those dolls. I remember asking Santa for a Kid Sister for Christmas that year and making him very uncomfortable. He said I'd have to ask my parents about that, but they assured him that it was fine, just the name of a doll. I was so happy that Christmas morning, especially when I saw that my doll had a little brother to play with! Alas, aside from this picture, neither boy was very interested in the dolls. Little Elvis read their names and pointed out the TM (trademark symbol) on their overalls. I think Baby Plum took off Mikey's hat and shoes. Too bad I didn't like to play with cars or legos, or something more interesting for boys. At least they seem to enjoy some of my old books. From what I can gather, Bob spent most of his early childhood destroying his toys. I think he just wanted to figure out how they worked. So we don't have any of his toys. I have a feeling they would appeal to both boys more than my dolls and Carebears. I remember those! I didn't have one, but when I was pregnant I would sing the commercial to my belly! HA! I think the only toy I have that has been passed down is a little yellow van that I called the A-Team van. Now my son does too. 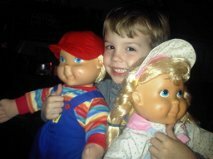 I still have cabbage patch kids that my boys are...completely disinterested in. But I have hope because Noah only seemed to get into his stuffed animals around age 3 or 4. It didn't transfer to the dolls - but, maybe with Mattias? You've got a great photo, at least!